Singer and entrepreneur, Raphael Oladibillionaire Onome popularly know by his stage name, 2kriss, who was rumored to be Tonto Dike's lover, added a year today. 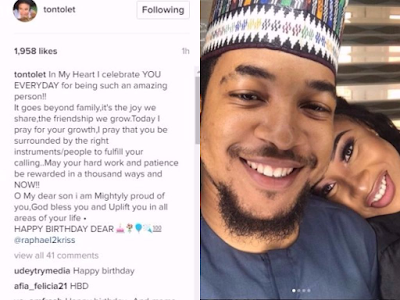 The excited actress and mother of one took to her Instagram page to wish him a happy birthday. "In My Heart I celebrate YOU EVERYDAY for being such an amazing person!! growth,I pray that you be surrounded by the right instruments/people to fulfill your calling..May your hard work and patience be rewarded in a thousand ways and NOW!! HAPPY BIRTHDAY DEAR 🎂💐🎈🎉💯 "
Son? Yes you heard her right, this is the point where critics should step down.